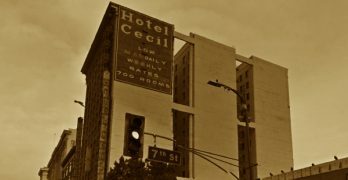 The Cecil Hotel in Los Angeles dates back to the 1920s and is said to be one of the most haunted hotels in America. The Cecil Hotel was built in 1924 by William Banks Hanner, who wanted to cater for both tourists and business visitors. It was designed in the Art Deco style by Loy Lest Smith and cost a cool $1 million to construct and initially had 700 rooms. Inside the decor was opulent and no expense was spared. However, unfortunately for Hanner the Great Depression was just around the corner and the area where the hotel was built soon became one synonymous with homelessness and transient workers. The hotel itself became rundown and it was not until 2007 that some work was undertaken to renovate it. More recently it changed hands and underwent further work, being marketed as Stay on Main and in 2017 the hotel was given historic status by LA council. The hotel also has a rather darker side to it, with a long list of murders and suicides associated with it. It has also been the home to several murderes and serial killers, who operated from the hotel whilst carrying out their crimes. 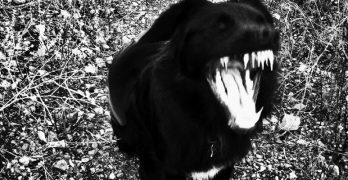 The most famous of these was Richard Ramirez, known as the Night Stalker. He killed thirteen peoplewomen, tried to kill another five, sexually assaulted nearly a dozen before he was caught. During the time he was carrying out his murders he lived in the Cecil. In 1991 Austrian journalist and convicted killer Jack Unterweger also took up residence whilst he was supposed to working as a crime writer. Instead he used police access to pick out victims and managed to murder three women in LA before leaving and murdering elsewhere before he was caught in 1992. The Cecil Hotel even inspired the 2015 season of the TV series American Horror Story. There have been many suicides or suspected suicides in the Cecil Hotel and many guests and paranormal investigators have reported seeing related ghosts or strange activity that could be tied to these. November 19, 1931 and 46-year-old W.K Norton was found dead, having committed suicide using poison capsules. September 1932 and 25-year-old Benjamin Dodich was found dead in his room , having shot himself in the head. In July 1934 53-year=old Louis D. Borden was found dead in his room, he slashed his own throat with an open razor. In March 1937 Grace E. Margro fell or jumped from the ninth floor of the hotel. Although her fall was broken by telephone wires, she died in hospital. It was unclear whether she intended to kill herself or the fall was an accident. In January 1938 35-year-old Roy Thompson leapt from the roof of the hotel to his death on the skylight of a nearby building. In May 1939 39-year-old Erwin C. Neblett, Navy officer from the USS Wright, killed himself in his room using poison. In September 1944 19-year-old Dorothy Jean Purcell gave birth in a room she was sharing with 38=year-old Ben Levine. Purcell said she did not want to wake him up so gave birth in the bathroom and then threw the baby out the window! The reports indicate she was unaware she was pregnant and she was found not guilty of murdering her child by pleading insanity. In late 1947 35-year-old Robert Smith threw himself out of the seventh floor window. In the fall of 1945 55-year-old Helen Gurnee also jumped from the seventh floor. Early in 1962 50-year-old Julia Frances Moore jumped to her death from the eighth floor. In October 1962 27-year-old Pauline Otton jumped from the ninth floor window. She actually landed on 65-year-old George Gianinni, killed them both. In 1975 an unidentified women in her 20s jumped from the twelfth floor to her death. The most recent possible suicide linked to the Cecil was in 2015 when the body of a young man was found outside the hotel, though the coroner has never confirmed the cause of death. The Cecil hotel has been the home to two infamous serial killers and been the sight of several murders. 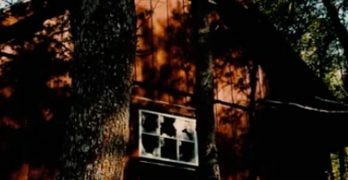 Guests at the the hotel have reported seeing figures and other odd activity that could be related to these crimes and criminals. in 1985 Richard Ramirez, known as the Night Stalker, stayed at the hotel whilst he went on his bloody spree. He managed to kill thirteen different people and carried out numerous rapes and tortures on his victims. It’s reported he used to strip out of his bloody clothes and just walk into the hotel partially naked after his crimes, the hotel being so run down and the neighborhood so bad at the time that nobody batted an eyelid. He was eventually caught and given the death sentence but he died of illness on death row. In 1994 Austrian journalist Jack Unterweger checked into the hotel whilst he was conducting some research for his work as a crime reporter. He took part in ride alongs with the local police but little did anyone known that he’d already killed in his past. Back in Europe he’d been found guilty of murdering a woman but was released after his model prisoner behaviour led to a campaign to have him freed. He used his time with the police to pick out victims and killed three prostitutes before fleeing LA to continue his murderous spree elsewhere in the country. He was eventually caught the next year and hung himself in prison. In February 2013 21-year-old Candaian student Elisa Lam’s body was found in a water tank on the roof of the Cecil, it had been there for 19 days. Footage from the hotel’s elevator showed Lam behaving very strangely, with the young woman hiding from and even seemingly to talk to invisible people. The elevator itself also seems to have a glitch and not be functioning normally. 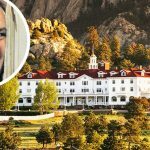 Some have said the footage is evidence of the many ghost in the hotel but other have pointed to her mental illness in the form of bipolar disorder. Others have said that the video was altered after the fact. Other theories include that Lam was under the influence of drugs or even possessed. No charges were brought and her death was eventually ruled an accident, but some people remain unconvinced and think she was raped and murdered. Her death is said to have been similar to the horror movie Dark Water and also inspired an episode of TV detective show Castle.